Fastest/slowest cpu in the world! 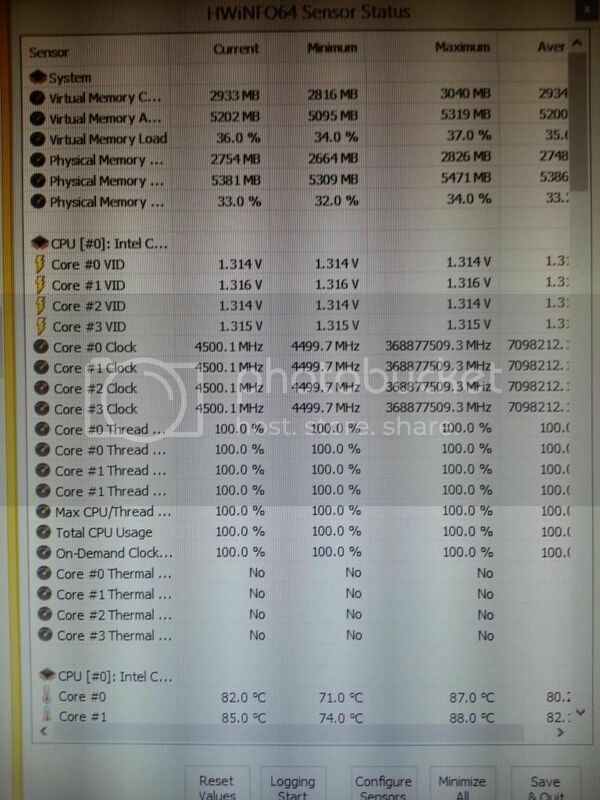 My brand new 4770k is showing these massive clock speed spikes while stress testing. As you can see of the tests showed that the cpu speed dropped to a lowest of 40mhz and raised to a huge number, Is this even possible? At no point did the system crash. They appear irrespective of voltage and, as far as i can tell clock speed. They also appear while gaming. Curiously aida64 shows these same spikes while cpuz doesnt and remains a rock solid 4500 give or take a few mhz. As its a new cpu I want to make sure everything is ok and the different reading from cpuz and the parity of readings from aiida64 and hwinfo have me confused as to which reading to accept. 1st post on the forums and apprectiate any help. (10-29-2013, 04:32 PM)Aff Wrote: ...My brand new 4770k is showing these massive clock speed spikes while stress testing. CPU is attempting to protect itself from overheating damage, so it's throttling back some of the cores. Be glad. Your stress test may be showing you did something wrong. Did you properly apply the thermal paste to the CPU? Lets' see what Martin (Mr. HWInfo) has to say. Those values are clearly wrong and might be caused by a rare glitch in the clock measurement procedure. AFAIK, AIDA64 and CPU-Z use the same method, though there might be slight differences. It might be helpful for me if you would post the HWiNFO Debug File capturing this problem. You might also try to deactivate the "Periodic polling" option (under Settings/Safety/CPU Clock measurement) to see if that avoids such spikes. Also make sure the "Bus clock-based" option is enabled. The pictures show the cpu under full load and temps well short of the limit when the chip should start to throttle itself which i think is 105 degrees or so. Martin, I will rerun some tests and get a debug file for you after work. Bus option is ticked. If I untick the periodic polling does that still show changes in clock speed as it seems very static and not fluctuating the clock speed slightly like it usually does?. If you hover the mouse above particular options in HWiNFO, it will tell you a bit more about what they mean. Disabling the "Periodic polling" will still properly reflect change in ratio on the fly, but not a change in BCLK (which occurs only if you change BCLK on the fly). (10-29-2013, 07:49 PM)Martin Wrote: If you hover the mouse above particular options in HWiNFO, it will tell you a bit more about what they mean. Ah I see. I did see the info but was still abit unsure about how it arrived at its calculations. So the only way a clock speed change occurs is when either the bios( through speedstep, cstates) chages the multiplier of the chip up or down depending on load? I take it the bclck is a constant value that can only be changed when either edited in the bios or edited on the fly with a specialist overclocking programe in windows. So clock speed readings due to the bclck changing, if it's not been edited on the fly are misreadings? ****edit sorry martin the file wont seem to attach. completes uploading but does'nt get added? Hopefully attached is a debug file. Hope this helps. I will disable the polling option on the next run.